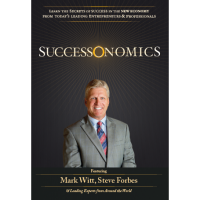 Crossville, TN — March 27, 2014—Mark Witt, President of Witt Finnancial Group LLC and Crossville, TN resident, has teamed up with world-renowned financial guru Steve Forbes as well as a select group of the world’s leading experts to Co-Author the Best-Selling Book, SuccessOnomics. Released on March 27, 2014, SuccessOnomics has quickly become a Best-Seller on Amazon.com. SuccessOnomics is the first book for Witt, who has fifteen years of experience in the financial services industry. Proceeds from the sale of SuccessOnomics are going to Jacob’s Turn, a charitable organization aimed at helping children with special needs reach their full potential and live fulfilled, joyful lives. Jacob’s Turn is very close to Mark Witt’s heart as his 23-year-old son, Grayson Witt, has special needs. SuccessOnomics is currently available at Amazon.com. To learn more about Jacob’s Turn, visit JacobsTurn.com. To learn more about Mark Witt and Witt Financial Group, visit WittFinancialGroup.com.